The U.S. Geological Survey produces several nationwide series of topographic maps at different scales: 1:24,000; 1:100,000; and 1:250,000-scale. The most detailed national map coverage is the 1:24,000-scale topographic quadrangle series. These maps show many features in addition to the brown elevation lines that show topography. Scanned (digital) topographic maps are called "Digital Raster Graphics" or DRGs. One version of DRGs are individual files that include the outside or "collar" information; "collarless" versions clip off the outside information in order to create seamless files. Original maps: Minnesota had completed once-over 1:24,000-scale coverage in the early 1980s. Updated maps: Between 1991 and 1996, a cooperative program with the USGS produced 138 revised 1:24,000 topographic maps for the Twin Cities, Duluth, St. Cloud, Moorhead, Mankato, Rochester, Red Wing, Winona, a few other cities, the growing suburban area of the Twin Cities-St. Cloud corridor and the Brainerd lakes area. See map. USGS has developed a New Generation of Topographic Maps, free online in GeoPDF® format. Minnesota's maps became available in 2010. The USGS Historical Quadrangle Scanning Project is scanning and georeferencing all scales and editions of topographic maps published by the USGS since the inception of the topographic mapping program in 1884. The maps are available for online viewing and download. 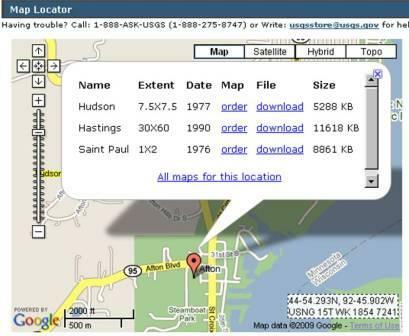 Geospatial Image Service: View DRGs using GIS software or Google Earth - no need to download DRG files. View, view change over time, and download historical topo maps with collar information in choice of JPEG, KMZ, GeoPDF or GeoTIFF. Search and pan DRGs of Minnesota at three basic scales (1:24,000, 1:100,000 and 1:250,000) and formats (small, medium and large). 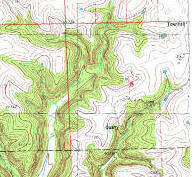 Minnesota Geological Survey: Purchase topo maps; free map index over the counter at MGS's St. Paul location. 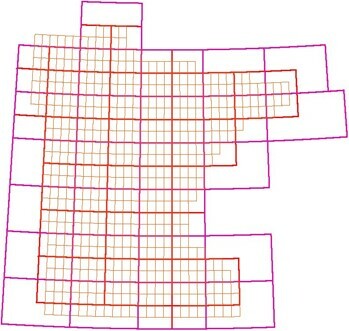 Mathematically generated grids representing USGS quadrangle map outlines. The datasets provide a standard framework for basemap development.